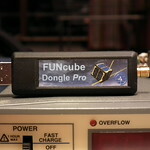 Just a quick note that Gqrx now uses pulseaudio for all audio I/O, which includes I/Q input from the Funcube Dongle. On Tuesday I took my Funcube Dongle to our weekly meeting at OZ7SAT for testing it on the air using some bigger antennas than my Arrow antenna. We were listening for amateur radio satellites and cubesat on the 70 cm band and we were using a standard Wimo X-yagi (8 elements I think). For SDR receiver application we used modified Quisk SDR running on Ubuntu Linux.